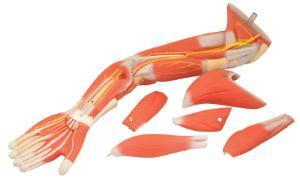 This six-part model of the human arm displays the important muscles, tendons, blood vessels, and nerves. Five muscles can be removed for additional examination of internal structures. Mounted on a base, but can be easily removed to study.